I so enjoy the fall colors. The air is turning brisk in the morning and the sun is dropping in the sky as we head toward the winter solstice. I love the fall season. 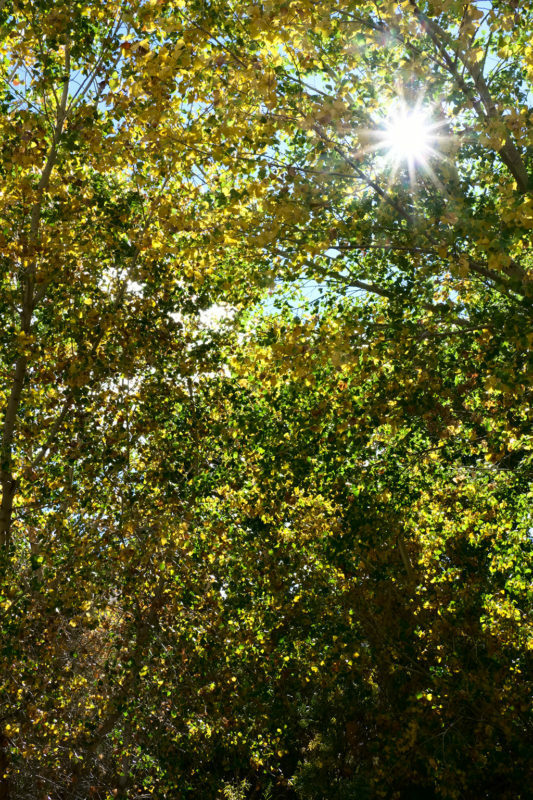 Only a few short weeks ago, I was walking in shirtsleeves along the Carson River in the midst of the fall season. Not long after this image was captured, the weather turned blustery and cool, a sure sign that winter was coming. And, not to disappoint, the windy days were followed by a distinct cooling and we moved into a late dry, cold fall. The temperatures fell into the ‘teens and the leaves quickly shed their remaining leaves, falling into their winter clothes. It was not long before the first rains came. We do not have a lot of rain here on the east side of the Sierra Nevada. But, we have some. Soon, the rains were mixed with and then replaced by snow. I do not mind the snow. Neither does The Girl. She is heavily muscled and the cold does not bother her so long as we are moving. I can layer up and the cold does not bother me (so long as we are moving). Therefore, in the cold we move. I still love to walk along the Carson River. On some days the raptors are particularly active (gotta have food to generate heat) and they are beautiful in the colder light. They soar and call and sometimes I see them cup their wings on the hunt. I will always be amazed at those sights. The Girl pulls me along, always searching the sage for something to chase. She also plays in the snow and sometimes will go into a zoomie, running like crazy with her legs splayed out and spinning about me. The snow often makes her playful and we play. And then I will see an image like this one in my collection. There is a certain longing for the warmer days and the beautiful colors that have now gone as cold as the air. But it is alright — I know the season will turn yet again and bring warmer days and colors back to the land. I feel a certain rhythm to the change and it is something that resonates with the internal changes I experience with the seasons. It is good. Life is good. Thanks and you’re welcome, Judy.